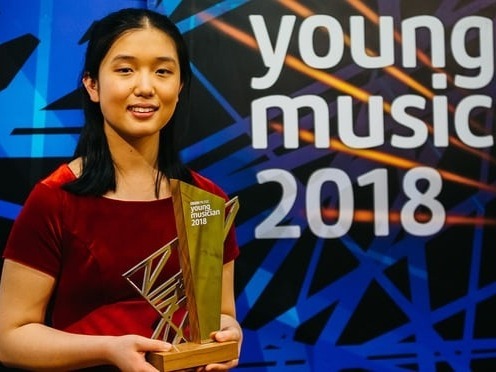 16-year-old Lauren Zhang has taken home 1st prize in the Grand Final of BBC Young Musician 2018. Lauren is studying for her GCSEs in Birmingham, and has been attending the Birmingham Junior Conservatoire since 2009. She began taking piano lessons at the age of four and also plays the violin. Lauren is interested in history, biology and physics. In her spare time she enjoys reading, fencing and chamber music. See full biography below. The 2018 BBC Young Musician finalists were 18-year-old saxophonist Robert Burton, 18-year-old cellist Maxim Calver and 16-year-old pianist Lauren Zhang. The finalists performed with the City of Birmingham Symphony Orchestra conducted by Mark Wigglesworth in front of a live audience, and were judged by a distinguished panel of experts – conductor Alpesh Chauhan, cellist Natalie Clein, saxophonist John Harle and pianist Sunwook Kim. The panel of judges was chaired by Kerry Andrew, who sat across all five category finals and the semi-final. The 2016 winner of BBC Young Musician, cellist Sheku Kanneh-Mason returned to perform the 4th movement of the Elgar Cello Concerto. For the final, Lauren performed Prokofiev’s Piano Concerto No 2. Forthcoming appearances for Lauren following BBC Young Musician will include a performance on the BBC Radio 3 stage at BBC Music’s The Biggest Weekend in Coventry on Monday 28th May, and also at a special BBC Young Musician 40th anniversary concert at the BBC Proms on Sunday 15 July at the Royal Albert Hall. The Grand Final was broadcast at 7pm on BBC Four, presented by Clemency Burton Hill and Josie D’Arby with Alison Balsom and Dobrinka Tabakova, and also on BBC Radio 3 at 7.30pm presented by Kate Molleson with contribution from 2016 BBC Young Musician Finalist, Jess Gillam. What do we know about Lauren? At the time of winning, she is studying for her GCSEs at King Edward VI High School for Girls. She started learning the piano with Madeline Ignazito at the age of four. In 2010, Lauren joined the Junior Department at the Royal Birmingham Conservatoire, initially studying with Rebeca Omordia, and since 2011 with Robert Markham. In 2015, she achieved her fellowship diploma in piano performance, having previously completed her licentiate diploma the year before. In addition, Lauren has received advice and participated in masterclasses with Kenneth Hamilton, Fabio Bidini, Peter Donohoe, Kalman Drafi, Philip Martin, Pascal Nemirovski, and John Thwaites. Lauren also receives guidance from Christopher Elton. In 2016, Lauren won first prize at the 15th Ettlingen International Piano Competition in Germany. Among other achievements, she was a prize-winner at the Young Pianist of the North International Competition (2015) and the Wales International Piano Festival (2016), first prize winner in the EPTA-UK (18 and under) competition (2016), and first prize in the Emanuel Piano Trophy competition (2015). Lauren also plays the violin, studying with Sam Mason. She achieved her licentiate diploma in 2015 and enjoys playing in ensembles and orchestras. Lauren has participated in and organised various charity concerts and actively takes part in chamber music. Outside of music, she enjoys fencing, sketching and reading, and also likes physics, biology and history.